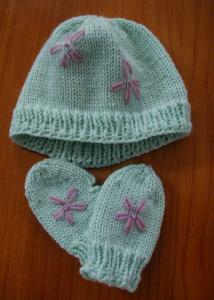 I'd been longing to knit something flowery for a little girl and my neighbor just happens to be expecting a baby girl. I used a soft wool from Baruffa, basic patterns from Ann Budd's Knitter's Handy Book of Patterns, and embroidered the little daisies with left over yarn from the boys' bear hat. My first time doing the embroidery!